Vargas died at a hospital in the city of Cuernavaca, where she had been admitted for heart and respiratory problems. Singer Chavela Vargas became a major figure in Mexico City's artistic explosion of the mid-20th century. 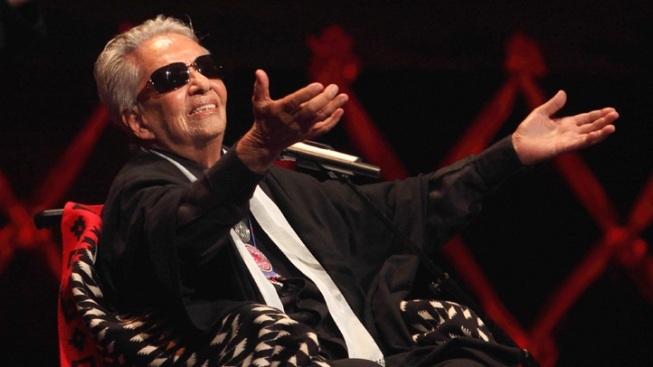 Chavela Vargas, who defied gender stereotypes to become one of the most legendary singers in Mexico, died Sunday at age 93. Her friend and biographer Maria Cortina said Vargas died at a hospital in the city of Cuernavaca, where she had been admitted for heart and respiratory problems. Vargas rose to fame flouting the Roman Catholic country's preconceptions of what it meant to be a female singer: singing lusty "ranchera" songs while wearing men's clothes, carrying a pistol, drinking heavily and smoking cigars. Though she refused to change the pronouns in love songs about women as some audiences expected, many of her versions of passionate Mexican folk songs are considered definitive. Born in San Joaquin de Flores, Costa Rica, on April 17, 1919, Vargas immigrated to Mexico at age 14. She sang in the streets as a teenager, then ventured into a professional singing career well in her 30s. "I was never afraid of anything because I never hurt anyone," Vargas told the audience at a Mexico City tribute concert in June 2011. "I was always an old drunk." Vargas recorded 80 albums, becoming a major figure in Mexico City's artistic explosion of the mid-20th century. She was a friend and a frequent house guest of the Mexican painters Frida Kahlo and Diego Rivera and was close to the Spanish writer Federico Garcia Lorca. Along the way she was honored as a "distinguished citizen" of Mexico City and was given Spain's Grand Cross of Isabella the Catholic. In 2007 the Latin Recording Academy gave her its lifetime achievement award. She appeared in the 2002 film "Frida," about her old friend, singing the eerie song "La Llorona," or "The Crier," in a hoarse but haunting voice. "I don't think there is a stage big enough in this world for Chavela," wrote the Spanish director Pedro Almodovar, who featured her music in many of his films. Though her liaisons with women were known throughout her life, Vargas did not publicly come out as a lesbian until publishing her autobiography "Y si quieres saber de mi pasado" ("If You Want to Know About My Past) at age 81. "What hurt was not being homosexual, but what they throw it in my face as if it were the plague," she wrote. As a youth, she suffered from polio and she attributed her recovery to the shamans she consulted. Her doctor, Jose Manuel Nunez, said Sunday that she had refused to accept breathing tubes or other measures to keep her alive. "She had to have a natural death," he said. Cortina said Chavez "went with great peace. She never complained." She was conscious to the end, the writer said. "She sought my hand and her shamanic medallion." In 2011, Vargas was still at work, releasing a new album of Garcia Lorca's poems and basking in standing ovations from a wheelchair on stage while wearing her emblematic neckerchief. In interviews she said she was at "peace with life and could not ask for more," saying that at death, she would "go with pleasure." "Each of you remembers me as you like, each one say what they feel and what they lived with me," she said. "I ask God that wherever I am going someday, you will come to greet me, and I will greet all of you."